The following reference guide identifies the language syntax, built in variables, functions, and classes that are used to code your simulations in Tychos. Tychos uses the MathNotepad language. We have included documentation here for some of the helpful functions defined in the MathNotepad language. This is not a complete list of all functions available in MathNotepad, just ones that might be commonly used in Tychos for building scenarios as well as defining goals for those scenarios. t — How many seconds has passed since this Scenario was started? dt — Time between frames as seconds, e.g. 0.1 is 1/10th of a second. These are some common mathematical operators and functions for performing various calculations. The pow(base, power) function takes two arguments, raising the base by the power. The sqrt(positive_number) function takes a single non negative number and returns the real square root of the number. The abs(number) function returns the absolute value of a number. The following functions all use radians as the angle measurement. You can use pi to represent PI. The sin(angle) function is used to evaluate the trigonometric sine value for a given input angle. The input angle must be provided in radians. The cos(angle) function is used to evaluate the trigonometric cosine value for a given input angle. The input angle must be provided in radians. The tan(angle) function is used to evaluate the trigonometric tangent value for a given input angle. The input angle must be provided in radians. The asin(value) function is used to evaluate the trigonometric arcsine value (inverse sine) for a given input. The output angle is given in radians. The acos(value) function is used to evaluate the trigonometric arccosine value (inverse cosine) for a given input. The output angle is given in radians. The atan2(value) function is used to evaluate the trigonometric arctangent value (inverse tangent) for a given X and Y input. The output angle is given in radians. The deg_to_rad(angle) function is not part of the MathNotepad language but is provided as a helper function to make the conversion from degree angles to radians easier. The input is an angle measurement in degrees and the output is the angle measurement in radians. The rad_to_deg(angle) function is not part of the MathNotepad language but is provided as a helper function to make the conversion from radian angles to degrees easier. The input is an angle measurement in radians and the output is the angle measurement in degrees. The following functions provide operations for matrix calculations. If one of the input vectors has a dimension greater than 1, the output vector will be a 1x3 (2-dimensional) matrix. Return a random number larger or equal to min and smaller than max using a uniform distribution. If now min or max are given, then it returns a random value from 0 to 1. If just one value is given, then it returns a random number between 0 and the input value. 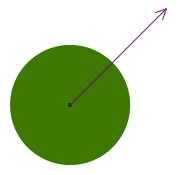 The drawArrow function draws an arrow and is commonly used to illustrate vectors for a particle. drawArrow should be called in the Calculations editor because it only draws the arrow for the current frame. If you call drawArrow() in the Initial State editor, you will not see anything. color — Optional HTML color value for your arrow, e.g. "red" or "#ff0000". The drawLine function draws a line and is commonly used to illustrate some connecting member like a string or cable, but could really represent anything you like. drawLine should be called in the Calculations editor because it only draws the line for the current frame. If you call drawLine in the Initial State editor, you will not see anything. pos — coordinates for the starting point of the line as an [X,Y] matrix. pos2 — the coordinates of the end point of the line as an [X,Y] matrix. color — Optional HTML color value for the line, e.g. "red" or "#ff0000". thickness — Optional stroke value that determines the visual thickness of the line. This function returns a unit vector representation of the given input vector. Its magnitude is 1 and the direction matches the direction of the input vector. This can be useful if you need just the direction of a vector, but not its magnitude. unit_vector(vec) -> returns a vector of length 1, and in same direction as vec. vec - any two dimensional vector as a [X, Y] matrix. This function returns the scaler magnitude of any given vector. This is helpful when you want to know the length of a vector, for example, if you want the magnitude of a vector, but not its direction. magnitude(vec) -> returns the scaler magnitude of the vector vec. This function returns a scalar degree measurement in polar form. This is helpful when you want to know the direction of a Particle's velocity vector. direction(vec) -> returns the scaler degree measurement of the vector vec heading in polar form. The following functions are used to compare two values as being equal or unequal as well as testing if one value is larger or smaller than another. These are very helpful when writing goals for students. The function tests if two values (x and y) are equal. It returns a boolean value of true or false. t == 10                # returns true if t is 10, or false if it is not. The function tests if one value (a) is larger than another (b). It returns a boolean value of true or false. The function tests if one value (a) is smaller than another (b). It returns a boolean value of true or false. The function tests if two values (a and b) are unequal. It returns a boolean value of true or false. t != 10                 # returns false if t is 10, or true if it is not. # If t is larger than 10, then the value of F is [10, 10], otherwise it is 0. The if() function returns true_result or false_result depending on test. if(a == b, "YAY", "darn")       # test is true; therefore returns "YAY"
The following operators are used to execute logical AND and OR comparisons for the use of evaluating logical statements. This is used for performing a logical AND conjunction. For example, "A and B" is true only if A is true and B is true. "A and B" is false if either A or B is false. This is used for performing a logical OR conjunction. For example, "A or B" is true if A or B is true. "A or B" is false only if A and B are both false. Tychos has only a few classes that are used to create the basic simulated objects in the Tychos universe as well as a few tools for analyzing those objects in the simulated world. The two simulated objects in Tychos are the Particleand the Block. The tools that can be used for analyzing the behavior of your simulations are the Graph and the Meter. A Particle represents a spherical particle in the simulated world and is drawn as a colored circle in the World View. A particle has position, radius and color. pos — The inital position of your particle in [X,Y] coordinates. If you don't specify a position, the default value of [0,0] is used. radius — The radius of the circle that is drawn in the World View to represent this particle. color — The particle will be drawn in this color. Use HTML colors e.g. "#ff3300", "blue". These attributes may also be modified on the particle after it is created. In particular, one will usually change the pos attribute of a particle in the Calculations editor to show a particle's movement. E.g. Another particle representation in Tychos is the Block. A Block is very similar to a Partcle but it is represented as a colored rectangle in the World View. A block has position, width, height and color. Just as with Particle's, Tychos only uses the width and height attributes for display. You can define how these attributes change given the rules of the simulation that you define. pos — The inital position of your block in [X,Y] coordinates. If you don't specify a position, the default value of [0,0] is used. size — The width and height of the block that is drawn in the World View to represent the block. color — The block will be drawn in this color. Use HTML colors e.g. "#ff3300", "blue". These attributes may also be modified on the block after it is created. In particular, one will usually change the pos attribute of a block in the Calculations editor to show a block's movement. E.g. One big difference between the Particle class and the Block class is that Blocks can rotate. This allows you to simulate rotational behavior. block.rotate(angle=0) — Rotates the block object by a given angle value in degrees. This method should only be called from the Calculations code editor. Blocks can also be represented with an image by setting the image attribute of the object. The text must be a URI link to a graphic file that can be a PNG, SVG, GIF, or JPEG image. A Block that looks like a rocket. You can represent a spring in Tychos using the Spring class. A Spring is a visual representation of a common elastic connector that displays a given number of coils that dynamically change shape once the dimensions of the Spring are changed in the Calculations Pane. pos1 — The position of one end of the Spring. If you don't specify a position, the default value of [0,0] is used. pos2 — The position of one other end of the Spring. If you don't specify a position, the default value of [100,0] is used. coils — This is the number of coils represented. width — This is the width of the coils. thickness — This is the stroke weight of the coils. The code below shows the three different Springs above that have different lengths, widths and coil numbers. The Particles are shown just for reference. These attributes may also be modified after the Spring is created. In particular, one will usually change the pos2 attribute of a Spring in the Calculations editor to show Spring's movement or deformation. Tychos also provides several widgets for displaying data in different ways as well as adding user interactivity so that your simulations can respond to input. A Graph is a 2-dimensional chart of data that you specify in the Calculations editor. Each Graph that is created will appear on the right side of the World View. Your program needs to add points to the graph with the plotcommand. title = Optional text that will appear at the top of the graph. 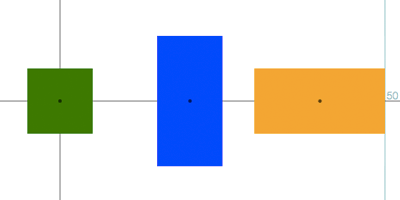 graph.plot(x, y, color=default_color) — Adds a data point to your graph. graph.integrate(color=default_color) — When you call the plot function of a graph, you create a new plot set. You can then integrate this plot set. This is done by referencing the plot set's color. This returns the calculated area based on the trapezoidal method of approximation. A Meter is a numeric display of data that you specify in the Calculations editor. Each Meter that is created will appear on the left side of the World View. Your program needs to tell the Meter what value it needs to display by using the display command. title = Optional text that will appear at the top of the meter. meter.display(value, units) — Displays the value on the Meter. value = Numeric value to be displayed. units = String representing the unit label to be displayed. A Gauge is an analog display of data that is very similar to a Meter that you specify in the Initial Sate pane. Each Gauge that is created will appear on the left side of the World View. Gauges also need to to be set up with a specific minimum and maximum value for identifying the range of the Gauge. Your program needs to tell the Gauge what value it needs to display by using the display command. Gauges with different colors and different ranges. title = Optional text that will appear at the top of the Gauge. gauge.display(value) — Displays the value in the Gauge. A Slider is an interactive widget that allows you link a value in your scenario to the current value of a horizontal slider. title = Optional text that will appear at the top of the Slider. x = slider.value — Returns the current value of the Slider. This is read/write. The keyboard object represents your computers keyboard and has commands to see if any keys are pressed during a simulation. keyboard.last_pressed(key) -> boolean — was key typed? i.e. key was pushed down then released. The mouse object represents your computers mouse. It has a command to get if buttons are pressed. mouse.is_down(button_num=0) -> boolean — Return whether the mouse button is pressed. button_num — Which button to check? 0 = primary button, 1 = secondary, etc.